This was inevitable even though Microsoft tried as hard as possible to avoid it. Users are getting sick and tired of the automatic updates and the feeling of helplessness they create to the end user. Now it actually was well intended by Redmond. They wanted to set up a logical bug testing rhythm and cadence that started at Microsoft and ended up on the consumer’s desk. Unfortunately customers who don’t have the flexibility of professional or enterprise update delay options are rebelling. There have been a few high profile cases of Windows updates that went awry and so some options to disable Windows 10 automatic updates have sprung up. So this is actually a pretty ingenious way of getting Microsoft to leave your PC alone. 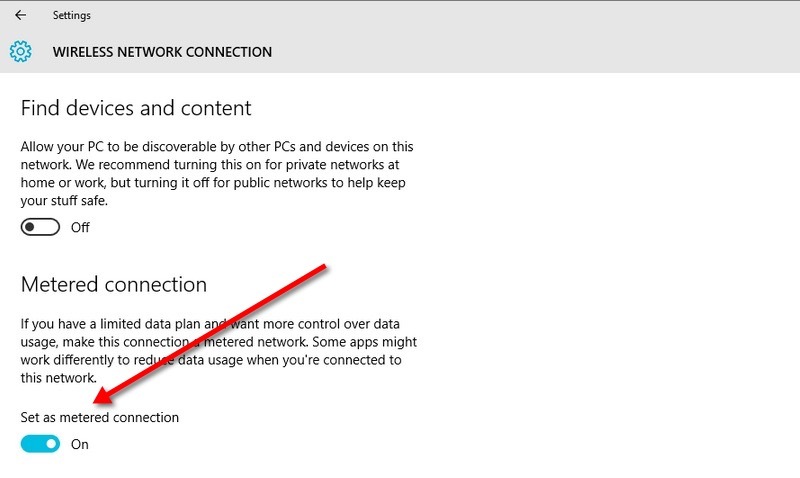 In Windows 10, if you’re on Wi-Fi, Microsoft have this option for you to explicitly specify that you’re on a metered connection. This is just for wi-fi users who are paying for their data usage and wish to conserve their data plans. To enable the setting, bring up the Start Menu and perform a search for Change Wi-Fi settings. Open the resulting option and navigate to Advanced Options. Locate the Set as metered connection toggle and enable it. This tells Windows 10 not to download updates to your system because you are being conservative with data usage. To do this, open the Run command and then type “services.msc” and press the “Enter” key. The Services list should appear. From here, you can find the Windows Update service. Open it. Under the General tab, change “Startup Type” into “Disabled.” and then restart. The Windows Update Service should be disabled at this point. Here’s an image of the 3 screens. Click on it for a larger version. If you want to re-enable it in the future, go through the steps again but this time change “Startup Type” to “Automatic”. Step 1: Press the Windows key to bring up the Start Menu. Type in Group Policy Editor and open the tool from the results. Step 2: Navigate to Computer Configuration and expand the Administrative Templates folder. Step 3: Within the folder, select All Settings and then locate the Configure Automatic Updates entry in the subsequent screen. Step 4: Double-click the entry and enable it by clicking the Enabled radio button at the top-left. Step 5: Open the combo-box and select the final option: Allow local admin to choose setting. Now that you’ve successfully managed to enable the option to allow advanced control over the updates, you need to access it. Open up Control Panel and navigate to the System and Security settings. Open Windows Update and select Change settings. There, you’ll be presented with the option to Check for updates, but let me choose whether to download and install them. Set your system to this setting and save it. Now, your system will regularly check for updates and show you a list of available updates; from there you can choose the ones you want to install at your discretion. This is NOT recommended at all. Do not try this at home!! You can also disabling update checking altogether. Open up Group Policy Editor, using the method detailed above. 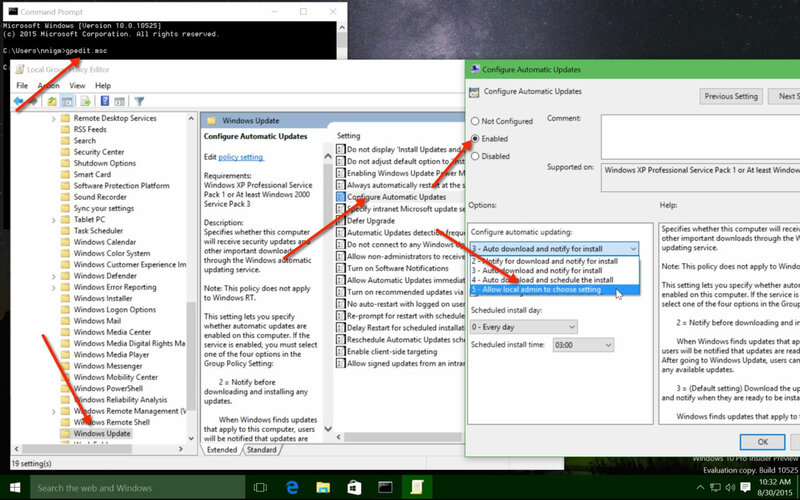 Navigate to the Configure Automatic Updates setting from the All Settings folder. Set the toggle to Disabled. After this, your computer will no longer even check to see if any updates are available for the system. Group Policy Editor is only applicable to users on the following SKU’s – Windows 10 Education, Enterprise and Pro. For users who don’t have group policy access, they can do the following steps. Microsoft has also released a tool that can be used to hide or disable Windows 10 updates selectively. All you need to do it, download it from Microsoft’s website, and install it on your computer. Follow the instructions on the website to disable the problematic update you are having trouble with. There you have it. 5 ways to stop updates. Praise the Lord!! Thanks for this list!! Probably means that you don’t have full admin rights on your PC. I did the screenshots from Windows 10 Pro so I’m pretty sure..
but there is no screen shot of the windows update control page after the GPO is enabled, the above only shows the gpedit screen shots. Please can you post a dump of what your Windows Update control panel looks like after the GPO is enabled because both PeeJayCee and I can’t see any additional options or controls. Maybe it’s a version thing or something but I don’t think that enabling this policy (as per No.3 above) will give you back the old missing Windows 8.1 update control panel (especially if your one of the users where upgrading to Windows 10 Pro has stripped it out – and I thought that was everybody). Further more, once you have attempted to enable this policy you will be left with the same ‘Some Settings are Managed by your organisation’ message that both PeeJayCee and I are getting. Even after you set the policy back to ‘Not Configured’ this will remain, so you then lose the drop down option to ‘Choose how your updates are installed’. gpupdate /force then reboot has restored things back to default. Please can someone else test if no.3 works for them because it would be really useful if it does. I have tested it and no.3 doesn´t work, also as build-in admin. When Onuora says it works, then must he give us the screenshots! Okay Andy, your advice helps! “Some Settings are Managed by your Organisation” is disappeared. Thanks! Now we wait for the screenshots of Onuobi, how to access the #3 option. He said, on his Windows 10 Pro it runs. I´m stretched. But “Windows Update” in Control Panel/categories/System and Security, this must be another Windows10 he has. Group Policy Editor or Registry Editor. It’s my PC, I am the only admin… Is there a way to be a super admin? I do NOT see Windows Update option as well. #3 is NOT working. I recommend to my users the uninstall the update: KB3035583. Then restart & find KB3035583 in listed in updates to be downloaded again. Right click on the update to HIDE it and the Windows 10 will not happen to that PC. You can create a simple batch file somewhere with ‘net stop “wuauserv” ‘ and put an ‘run as an administrator’ enabled shortcut in your ‘Startup’ folder. Then, it will be automatically disabled when you boot up and if you want to update, all you do is run the ‘Update & security’ in ‘Settings’. Have you try the Try the $25 tech Support 25dollarsupport its a Fix $25 price Computer Tech support company for Windows 10 updates fix.